Bluebird Hill is a beautifully decorated cabin (home) with 3 bedrooms & 3 ½ baths located in the Shenandoah Valley of Front Royal, VA. Our custom built cabin sits quietly at the end of a cul de sac, on 3 acres, with gorgeous views of the Blue Ridge Mountains along Skyline Drive as well as the Massanutten Mountains. The Shenandoah River can be seen in the Fall and Winter, but look for glimpses between the leaves in Spring and Summer too. It may seem like a world away, but our cabin is really very close to everything. 20-30 minutes from Skyline drive, wineries, caverns, hiking, biking, antiquing, history, festivals and so much more. No traffic noise, no street lights. Come to relax and explore with family, friends and nature. The cabin has 2 mater suites with KING beds. The large master on the main level boasts a walk in closet and a bathroom with double sinks and a tub. Walk out to the deck to enjoy your own private sitting area. The other loft master bedroom, although smaller (cozy) in size, is located on the 2nd level. It has a regular set of stairs and is fully enclosed. It has a stand up shower. Incredible mountain and river views any time of year from this altitude. Additional ½ bath on the main level. Great room has 2 reclining chairs, 2 sofas and a reading chair. Dining table seats 8. Bedroom - 2 bunk beds- twin over full and a full bath with a stand up shower. Sleep sofa sits nestled in front of the gas fireplace & flat screen TV. Custom bar has mini fridge for extra food and/ or beer. A ping pong table is ready for your friendly tournament. There is an air hockey table, but note that there are a couple of dead air spots. Card table with 4 chairs. Cabin comes fully stocked with dishes, bake ware, glasses, pots & pans & small appliances. We will provide paper products, kitchen condiments and dish washing soap. Full size washer and dryer. Linens and towels are provided to make this an easy getaway. Complete with 4 flat screen TVs, one in the great room area, 1 in the family room in the basement and 1 in each of the master suites. High speed internet, WiFi, Xfinity with 220 + channels. Landline with unlimited long distance calls in the US. Enjoy the natural beauty of the area relaxing on our spacious deck overlooking the mountains. Seating for 8 at 2 tables. Gas grill is ready. Smaller screened in deck area has seating for 2-4. We are stocked with games, puzzles and books for all ages. Wii and DVD player is located near the downstairs tv. THE DRIVE: Note- the one mile dirt road to get to our cabin is not state owned. It’s not steep, but it is full of pot holes. Slow and steady will get you to the cabin. You do not need a truck or 4 wheel drive HOWEVER- months where snow is in the forecast will require 4 wheel drive, as we do not know when or if someone will plow. Parking is unlimited. SECURITY: Please be aware that there are security cameras on the exterior front and back of the home to check weather conditions and to protect the house when it’s vacant. No cameras are located inside the home. PETS: Well behaved dogs older than 1 are welcome. We limit the number to 2 to cut down on the wear and tear to our home. $50 flat fee for 1st pet. $35 for 2nd. We have spent quite a bit of time making sure our cabin has everything you will need to make your stay comfortable. We have been inviting friends & family to enjoy our cabin since 2012. We now extend the invitation to you. Canoe/ Kayak/ Raft - Front Royal is the canoe capital of the world, you know. Rent or bring your own. Skyline Drive- Hiking and biking is great, but you can also just DRIVE. Lots of places to stop and picnic. Stargaze- The night sky comes alive at our cabin in the woods. Sit and Stare- The Mountain View is ever changing with the weather and seasons. It is always a good time to sit on the deck. We are not water front, but we have a great view of the Shenandoah in late fall and winter. You can hear the water flowing from the cabin. Fire pit- Nothing like a good Kumbaya at the end of a perfect day. Wine- We can suggest a number of excellent wineries within 30-40 minutes of the cabin. Hike / Bike- Skyline drive, Shenandoah State Park and Guest State Park are short drives away. Dinosaurs- Dinosaur Land. A silly must see for the young dino fan. History- If you are a history buff you will know just what to do. Otherwise check the pamphlets in the cabin for nearby sites. Golf- If interested, we can tell you about our favorite courses. $-$$$. Bird watching- Put out some seed and sit back and enjoy the show from the deck. There are also marked bird watching trails close by. Caverns- Skyline cavern is super close. Luray caverns is approximately 30-40 minutes. Absolutely Nothing- You can do everything or nothing at all. Your vacation, your choice. Dine- A number of worthy locations. Front Royal: Element, Blue Wing Frog, PaveMint Taphouse, Yama Fuji, Soul Mountain, Jules’s Caribbean BBQ & Thunwa Thai to name a few. Strasburg: Christina’s Café, Owen Street Diner, Po’ Greens, Nana’s Irish Pub & Historical Bakery & Café. We have tons of pamphlets available for you to look through to give you an idea of other things to do in the area. If you let us know your interests, we can help you plan your perfect get away. About us. 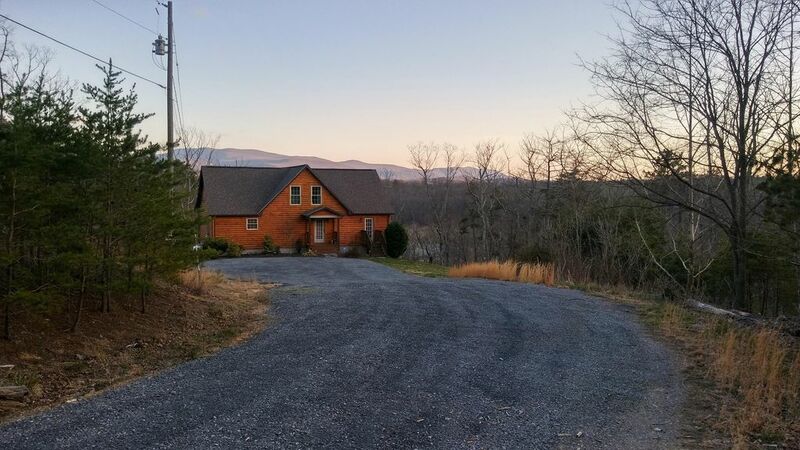 My sister, my husband and I looked and looked for a mountain retreat to call our very own. After months of not finding exactly what we wanted, we decided to build our own from scratch. Our cabin demands- We wanted a beautiful mountain view! We did not want to hear any traffic or see any city lights. We wanted 2 master suites. We didn’t want to be scared out of our wits driving to get there. (We can tell you, there are a lot of crazy, steep roads leading to some of the houses in the area) What started out as a “cabin” quickly turned into a full blown house. Bluebird Hill - Named for our parents because of their love / hate relationship with bluebirds. They had a bluebird box complete with said bird outside of their bedroom for years. It wasn’t until my dad passed away that a bluebird started pecking at my mom’s window. Obnoxiously! It’s a common behavior, but my mother insisted that my dad had come back just to irritate her. Our mom has since passed away, but we wanted to always remember. So that’s how we came up with the place and the name. We proceeded to put up a couple of bluebird houses, and what do you know? We had one move in a couple of years ago! Hi Dad! (Stay away from the cabin windows, please) After years of enjoying our cabin with family and friends, we have made the decision to share our home with others. We hope that you will enjoy it as much as we do. Welcome to Bluebird Hill. You can catch glimpses of the Shenandoah River from the house. The view is best when the leaves are off the trees. You will absolutely NOT have cell service if you are on a VERIZON plan. Sprint and AT&T will have cell service. Not sure of any other carriers. There is a land line for use. Central air. Upstairs window unit in summer months, just because it tends to stay a little warmer upstairs. 1st floor is wheel chair friendly. However, there are 3 front steps leading to the entrance. We found Bluebird Hill Cabin out of necessity, but quickly realized we were in for an amazing long weekend. My parents are from Front Royal and we brought them along with other family members for a family funeral. We cannot speak highly enough of the home and the care the owners take to stock the essentials plus so much more. As is typical of a VRBO, there were towels, sheets and all the necessities. But these owners go above and beyond with blankets to snuggle under beside the fire, games and puzzles galore, bird seed for the feeder, a local bottle of wine and firewood for the firepit. The kitchen is stocked with every appliance and utensil you could dream of which we used regularly. They had a zester, blender, soda stream and TWO coffee makers! We are foodies and cooked family meals every night. While the cabin had an air hockey and ping pong table, we found ourselves enjoying the wildlife show outside the beautiful windows. We departed today and had to drag ourselves away from the woodpeckers, blue birds, cardinals and SIX squirrels competing for the bird seed. Thank you for a memorable stay that made my parents feel like they were "back home" and made a tough weekend so enjoyable and memorable. What a wonderful experience. Our family was able to enjoy a relaxing vacation with our 3 dogs. Ann was an absolute delight to interact and communicate with. She promptly responded to every email, and provided excellent recommendations for outdoor activities, wineries, and local eateries. Her home is gorgeous, spacious, exceptionally well stocked, and immaculately maintained. We spent several hours admiring the view & watching the birds from the great room and the upper deck. Cherished memories were shared around the firepit. Needless to say I highly recommend Bluebird Hill. We spent 3 nights at Bluebird Hill to celebrate my father's 75th birthday. We were looking for a comfortable, quiet getaway to enjoy time together in the area with access to wine tasting, hikes and good restaurants. It was everything we had hoped for. From the moment we arrived, we were delighted with how well appointed and well stocked the place is. The home is impeccably clean and had everything that we needed and more. We felt at home immediately and truly enjoyed our time there. Our favorite moments were waking up to watching the birds at the feeder (thank you for the seed and suet!) and building a fire in the fire pit at night under the stars after exploring the area. We visited a couple fantastic wineries and the Skyline Caverns. We did not want to leave when it was time to go and keep talking about when we can return and bring more of our family. It is truly a special place. Beautiful cabin with a view! Like the title says this is a cabin with a view! Although to be fair it's a very nice home with a view and all the creature comforts you would expect in a high end home. It's the perfect spot to relax with friends and have a great meal paired with some local wine. Excellent space, accommodating hosts, and a fantastic weekend! Thanks! Beautiful, clean, comfortable property! Lots of attention to detailed amenities making guests feel welcome and TOTALLY at home. Owners are immediately responsive to messages. We are anxious to return! Thanks Jill. We would love for you to return. So thrilled you had a great stay. Your review means the world to us.